1. Walk out to the North Breakwater Light to watch Ludington's own carferry, the S.S. Badger, pass by. 2. Spend a sunny day at one of the many clean beaches. 3. Explore the magnificence of the Ludington Pumped Storage Plant. 4. Watch the golden sunset at Stearns Park. 5. Discover Mason County's heritage at Historic White Pine Village. 6. Bring the family downtown to watch a good old-fashioned July 4th parade. 7. Kick off your shoes and feel the sand between your toes. 8. Browse for antiques and collectibles in our unique stores. 9. Enjoy a delicious ice cream cone on a really hot day. 10. Board the S.S. Badger carferry for a memorable trip across the lake. 11. "Sleep under the stars" in one of the area's campsites. 12. Participate in the Mason County Library's summer reading program. 13. Enjoy Michigan farm fresh fruits and vegetables from a local farm market. 14. Experience the joy of fishing year 'round. 15. See how much fun you and your friends can have during a game of mini-golf. 16. Feel the "boom" of our spectacular Freedom Festival fireworks. 17. Watch the sun rise over Lincoln Lake from the Lakeshore Drive Beach. 18. Drive around our neighborhoods to see the winter light displays. 19. Take a drive down Ludington Avenue in the summertime to soak in the colorful beauty of the petunias. 20. Fire up the grill for a delicious outdoor barbecue. 21. Play a rousing game of volleyball with friends at the beach. 22. Explore the Ludington State Park with the snowshoes you just made in a workshop. 23. Take a bike hike around town, through the marina and along the lakeshore. 24. Experience the magnificence of a truly clear starry night, without interference from big city lights. 25. Discover the historical beauty of our area's lighthouses. 26. Rent a canoe, pontoon or kayak for a relaxing day on Hamlin Lake. 27. Take an exhilarating ride over the dunes at Silver Lake. 28. Golf among the pines at one of the many picturesque courses in the area. 29. Bring the kids to the Waterfront Park's wonderful playground, while you admire the surrounding sculptures. 30. Let the breathtaking colors of fall envelop you as you drive or walk the leaf-strewn streets. 31. Join your friends and neighbors for summer's very own Friday Night Live, which takes place during four Fridays in late July and early August. 32. Take the kids to Sandcastles Children's Museum conveniently located in downtown Ludington. 33. 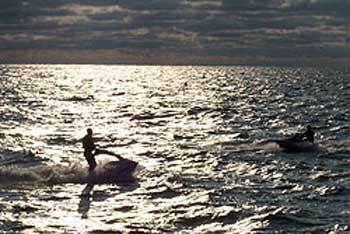 For a day you won't forget, head out on Lake Michigan aboard a charter boat. 34. 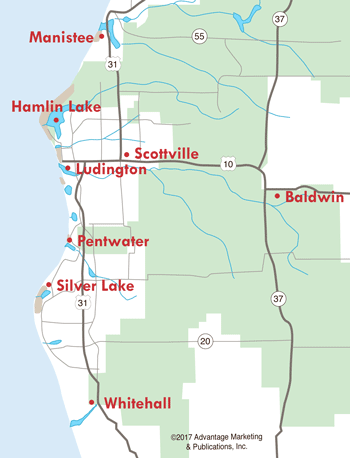 Ludington now has its own wind farm, called Lake Winds Energy Park. View 56 wind turbines just south of town. 35. Catch a play or concert....or take a class at the Ludington Area Center for the Arts. 36. While at Stearns Park Beach, let the kids expend some energy at Ludington's Skate Plaza. 37. Shop for goodies and treasures during the summer at one of two Art Fairs in downtown Ludington's City Park. 38. You'll want to be in Ludington on New Year's Eve to experience our very own Lighted Ball Drop. Fireworks, music, and drinks included! 39. Summer is the best in Ludington, so don't miss these top events.